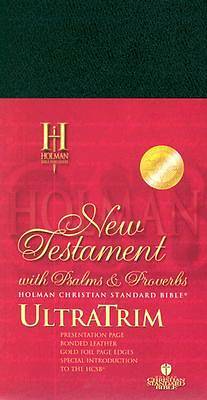 Now for the first time the Holman CSB "RM" New Testament with Psalms and Proverbs is available in this narrow trim size and choice of binding that is ultra-convenient and can be carried anywhere. About the size and shape of your personal checkbook, it fits easily into a coat, purse, pocket, backpack, glove compartment, briefcase -- any place lightweight portability is essential. In addition, this handy New Testament with Psalms and Proverbs is available in both handsome bonded leather and low-cost paperback formats. This remarkably readable translation carefully captures the nuances of the original languages for the contemporary Bible reader. More than fifteen years in the making, this truly 21"st" century translation draws on a vast collaboration of conservative scholars and English stylists, creating a Bible that reads both faithfully and easily -- every time you turn to it. For the perfect mixture of purity and clarity, explore the Holman Christian Standard Bible "RM."